Broadband is fast becoming a commodity among developed countries and the platform of user participation is available almost free to anyone. With the help of the proposed “100 dollar PCs” and economically viable Web connections, Africa and other developing countries will soon overcome the digital chasm, catching up with the rest of the world in access to computers and the Internet. Millions of new bloggers every week start online journals and people let loose their cyber alter egos in the Second Life. The question looming large is increasingly less about “digital opportunity” and more about how we can best manage the abundance of content, Web platforms and user participation. While we are seeing an explosion of blogs, an equal number of bloggers are leaving cyberspace at the same time out of frustration at the scarcity of response. After all, how many bloggers do you remember? They will need some systemic support to engage in sound online conversation and stay empowered. Platform providers, on the other hand, largely treat their participants as pairs of eyeballs to be sold to advertisers. They enjoy a vast amount of traffic to their platforms but do not provide the necessary support to protect users from potential legal disputes that arise from unwarranted posts. In the worst case, their sole motive behind providing the user-created content (UCC) platform is at most an exploitation of illegally copied and pasted content. Sure, UCC service providers need to survive as a going business concern and are in desperate need of a sustainable business model. In that sense, many pioneers in the user-created content platform have shown a way by striking an ideal balance between user empowerment and business exploitation. Countless numbers of bloggers and micro sites rely on advertising revenue sharing program to support their sites. Users as well as service providers will have to agree on the fair value of each of their contributions. Finally, are readers happier with the explosion of user-created content? Are they enjoying better news and rich entertainment? And are they better connected with the world with the introduction of user-created content? Last year, OhmyNews International Citizen Reporters’ Forum proposed the three main stakeholders in citizen journalism -- or user-created content at the greater level. They are citizen reporters, readers and editors. Tension among the three stakeholders has grown to an uncomfortable level recently as the commercialization of user-created content by the industry moved into high gear. The three stakeholders need to strike a grand deal, where a mutually beneficial relationship can be achieved among them. Say “Wikinomics” if you will. 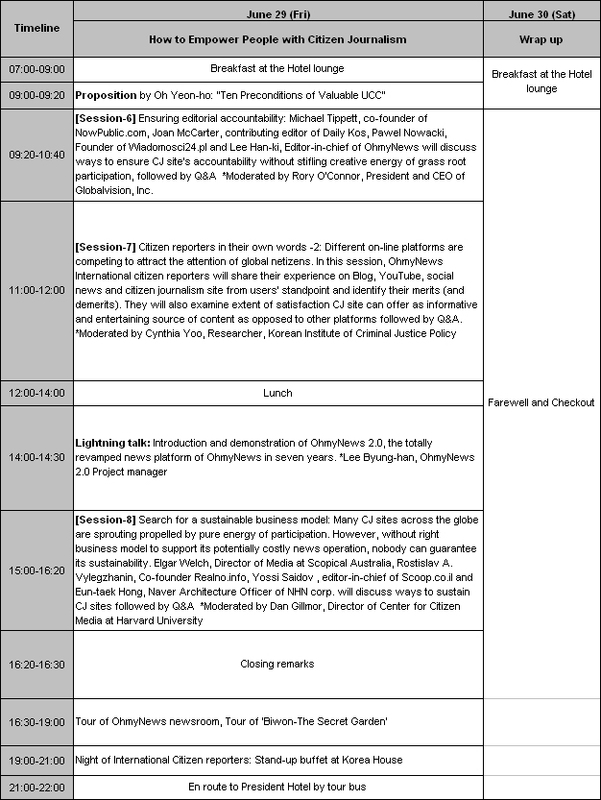 This year, OhmyNews brings together leading thinkers and practitioners in the field of citizen journalism and user-created content to Seoul. They have shown us ways to realize the vision of user empowerment without exploitation by designing fair and sustainable business models. Our distinguished guests and citizen reporters of OhmyNews will examine the status of citizen journalism and user-created content and discuss ways to empower citizens on the Web and encourage their participation. 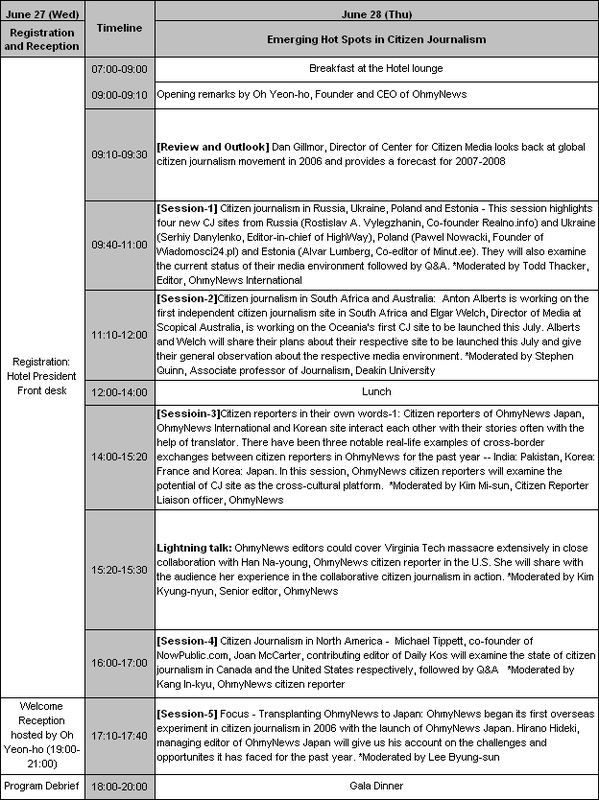 There is a host of pressing issues we need to tackle throughout the three-day forum: How can practitioners in citizen journalism balance user participation and editorial accountability? How can citizen journalism foster cross-cultural exchanges and contribute to the vision of a global village as envisioned by Marshall McLuhan? How can we sustain citizen journalism by identifying the right business models? I hope you will join us in this great discussion and return back home with plenty of valuable insight and renewed confidence in citizen journalism and user-created content. Rory O’Connor, Co-founder and president, Globalvision Inc. The main hotel is Hotel President. 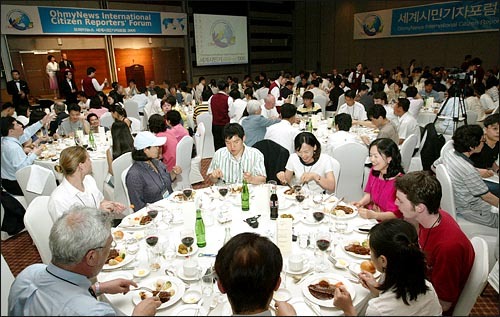 From Incheon International Airport, it is about one hour to the hotel by Korean Air limousine bus Line 1. The bus stops every 10 minutes at 11A or 4B on the arrival floor. Get off at Lotte Hotel. Hotel President is about a two-minute walk to your left from the bus stop. Fair is KRW13,000 for a one-way trip. 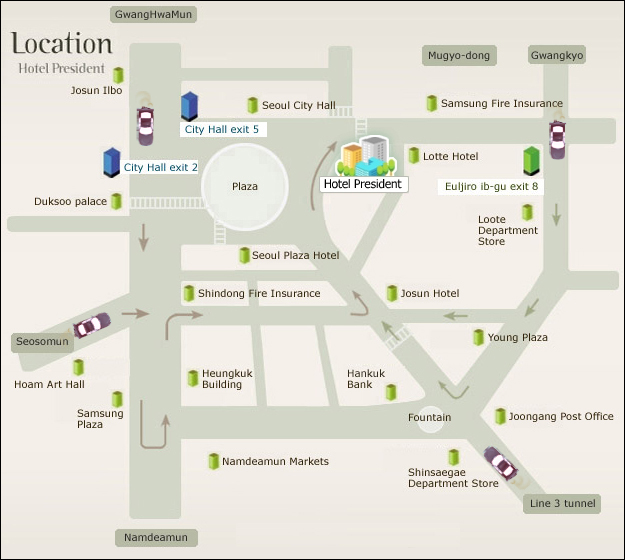 Complimentary shuttle service will be available two times a day at 9:30 and 15:30 from Incheon International Airport to Hotel President. The hotel shuttle stops at 13B on the arrival floor. 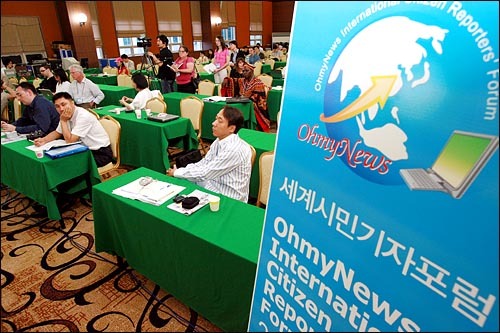 To register for the 3rd OhmyNews International Citizen Reporters' Forum, please send in your contact details to jean@ohmynews.com. The registration should include; your full name, name of your organization, phone number, email address, and your arrival and departure date for Seoul. We recommend our guests to stay in Hotel President.